Setting up a category is necessary for your site because it helps users to find out and read all the posts in a specific category of their interest. This way, they can learn more about what your authors publish and can come back again to read the new posts. Navigate through: User Frontend > Post Form. Select an existing form or add a new form. 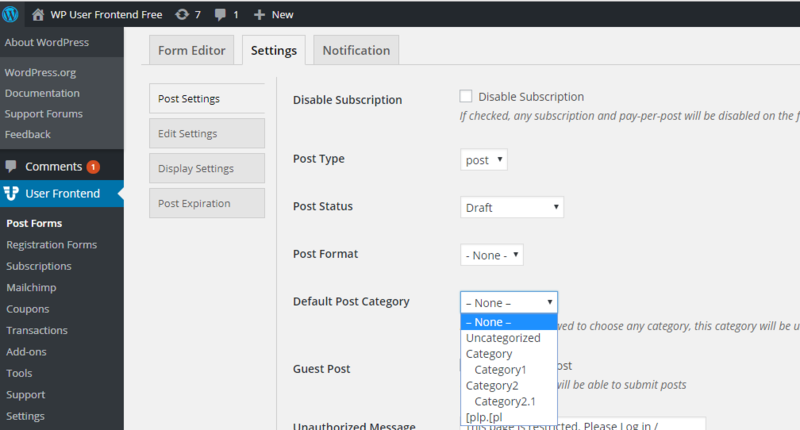 Then select Post Settings. You can see Post Type and Default Post Category. If your post type is “post”, you will see all the categories that are applicable for this type of post. If it is a page, you will see corresponding categories. You can set default category to “Miscellaneous”, if it cannot be categorized in any other category.